Rivers outside the chemical industrial park in East China's Jiangsu province where a deadly blast Thursday killed at least 47 people were not polluted after the incident, according to on-site checks. 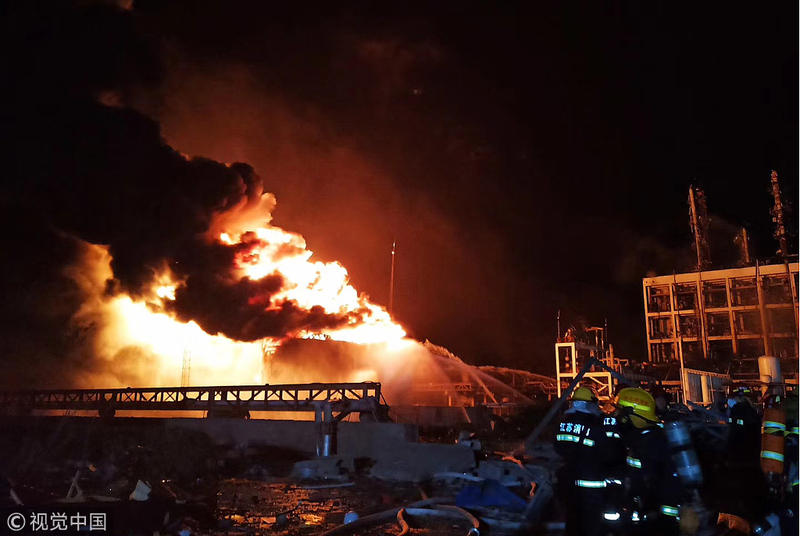 The explosion happened at about 2:48 pm following a fire that broke out in a chemical factory in an industrial park in Xiangshui county of Yancheng city, according to local authorities. Rapid tests on water samples collected at 8:40 am found the water of three rivers inside the park was polluted by volatile organic compounds — chloroform, methylene chloride, dichloroethane and toluene. But no volatile organic compounds were detected in the waters of the three rivers outside the park, according to the provincial department. For the most seriously polluted river, the dichloroethane and methylene chlorid concentration was about 2.8 times and 8.4 times higher, respectively, than the standard, it said in a release. One of the rivers - the Guanhe River - flows into the Yellow Sea, and the blast plant is only a dozen kilometers away from the river's estuary. So it's a must to stop polluted waters inside the park from entering the Guanhe River, according to a release from a special work team dispatched by the Ministry of Ecology and Environment. Therefore, local authorities have taken action to cordon off the rivers to prevent the polluted water in the park from flowing outside. 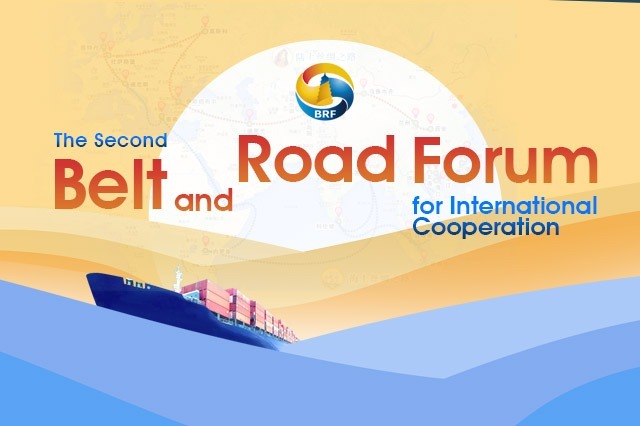 Attention should also be paid to rainwater drainage pipes to prevent polluted water running out of the park through storm sewer, the work team has required. As for air pollution, an earlier release from the department said sulfur dioxide and nitrogen oxides in the atmospheric environment were dispersing and the concentration is moving downward. Other pollutants, including benzene, toluene and xylene, are now at normal levels. There were no drinking water sources downstream of the explosion site and drinking water safety was not affected. 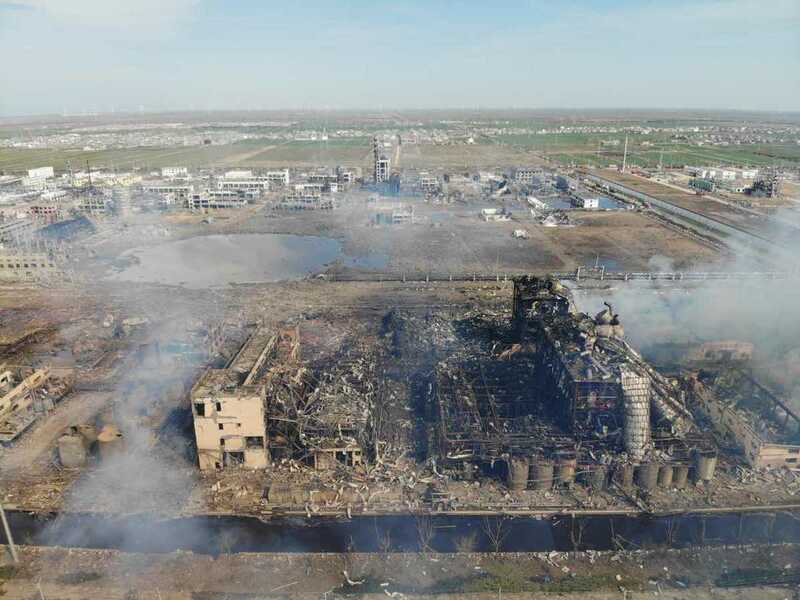 Official records show that the Jiangsu Tianjiayi Chemical Company, where the explosion took place, had been punished several times previously for using safety loopholes and violating environmental protection regulations. The State Administration of Work Safety, the predecessor of the Ministry of Emergency Management, listed 13 safety problems at the plant after an inspection last year, including a lack of safety training among management and chemical leaks. Prior to that, the company had received at least six administrative punishments by environmental authorities for violating regulations governing solid waste management, environmental impact assessment and air pollution from July 2016 and two years following, according to Qichacha, a databank that tracks business registration information in China. The company was subject to its latest punishment in July last year for illegally discharging pollutants and was fined 200,000 yuan ($29,836), the databank shows. 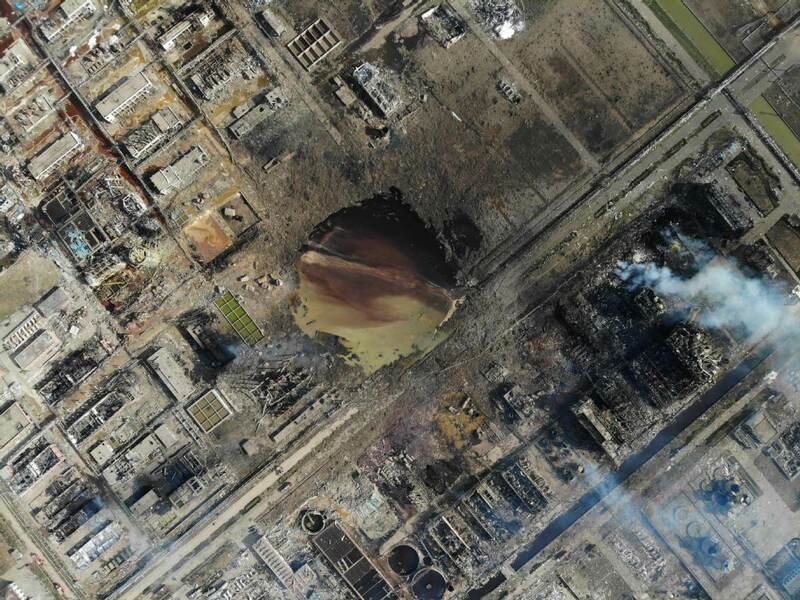 This was not the first time Chenjiagang Chemical Park experienced such a safety accident. In late 2007, an explosion ripped through Jiangsu Lianhua Technology Co Ltd in the park, killing eight people and wounding dozens. In November 2010, chlorine leaked at another company in the park - Jiangsu Dahe Chlor-alkali Chemistry Co Ltd, and poisoned more than 30 people nearby, according to previous media reports. Li Chunhua, director general of Green Stone Environmental Protection Center, an environmental NGO based in Nanjing in Jiangsu, said on Friday that they started to look into the park in 2015 and found not only the Jiangsu Tianjiayi Chemical Company, but many other enterprises there had safety hazards and pollution issues, including waste water and exhaust gas emissions. So in 2018, the entire park was put under a thorough overhaul and all chemical companies in the park were suspended from operation for rectification, he said. The overhaul lasted for about eight months.